Tucked away in the southern coast of Morro Bay lies the Morro Bay Estuary. Chorro Creek and Los Osos Creek filter into the Pacific Ocean creating a unique place to experience watersports and an exceptional habitat for hundreds of animals and plants. 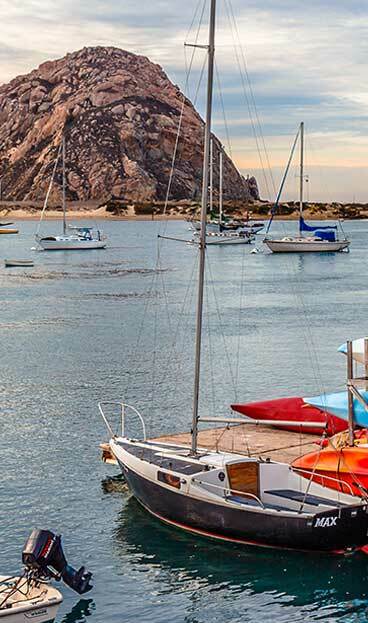 Protects Morro Bay from the effects of sea level rise, extreme high tides, droughts and storms. Makes for a safe and calm place to enjoy local water activities. Provides a place for wildlife to find food, rest and raise their young. It is an important habitat for threatened species such as Snowy Plover and the Peregrine Falcons. Important stop-over for migratory birds on the Pacific Flyway. Breeding ground for commercial fish species and the famous Morro Bay Oyster. Essential part of Morro Bay’s beautiful landscape. Morro Bay Estuary was established as a California State Estuary in 1994, and an Estuary of National Significance in 1995, but before these designations the bay had already experienced major changes and was headed towards collapse. Now the National Estuary Program works to protect and restore the Morro Bay estuary. You can learn about the history and the work which led to the Estuary’s protection in the Of Marshes and Morros documentary. Many things that make Morro Bay a nature lover’s paradise are tied to the Estuary. Both on land and from the water there are numerous ways to experience the Morro Bay Estuary during your visit. From short to long, easy to strenuous, Morro Bay has the perfect hike along the Estuary for you. Be rewarded with panoramic views and forests, flowers, and animals along the way…here are 6 hikes to try on your next visit. Get out on the bay via boat, kayak or paddleboard and enjoy the calm waters while using this field guide to help you identify some of the most common types of plant and animals that depend on our bay. And with Morro Bay water quality consistently rated A+ by Heal the Bay, it’s the perfect spot to be able to see those creatures beneath the surface. When you visit, we invite you to enjoy our natural assets, but also work to ensure that our natural playground is vibrant for years to come. Make simple choices to help the bay. Make sure your food wrappers, bottles, cups, straws, cigarette butts, and other trash goes into the bin. This helps keep our water clean and wildlife safe. Choose reusable items whenever you can—bringing your own water bottle or coffee cup with you makes a big difference. Dog poop sends harmful bacteria into our bay every time it rains. Please use the free Mutts for the Bay dog waste bags around town to pick up after your pet and keep our water clean for swimming, fishing, and paddling. Conserve water by turning off the tap when you brush your teeth, reusing your towels and sheets, and shortening your shower by a minute or two. Birds, otters, seals, sea lions, and other wildlife need our help to stay safe and healthy. Please watch wildlife from a distance. If an animal turns its head to look at you or moves away, you are too close. Animals waste valuable energy moving away from people who get too close. That means they can’t protect their young or themselves, look for food, or take care of their fur or feathers like they need to. Learn more by visiting the Morro Bay National Estuary Program&apos;s website or stop into the Estuary Nature Center.